Quartzite, a form of metamorphic rock, from the Museum of Geology at University of Tartu collection. Metamorphic rocks make up a large part of the Earth's crust and form 12% of the Earth's current land surface. They are classified by texture and by chemical and mineral assemblage (metamorphic facies). They may be formed simply by being deep beneath the Earth's surface, subjected to high temperatures and the great pressure of the rock layers above it. They can form from tectonic processes such as continental collisions, which cause horizontal pressure, friction and distortion. They are also formed when rock is heated up by the intrusion of hot molten rock called magma from the Earth's interior. 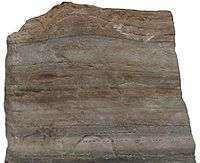 The study of metamorphic rocks (now exposed at the Earth's surface following erosion and uplift) provides information about the temperatures and pressures that occur at great depths within the Earth's crust. 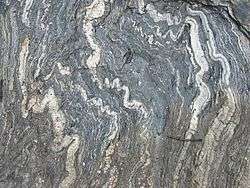 Some examples of metamorphic rocks are gneiss, slate, marble, schist, and quartzite. The change in the particle size of the rock during the process of metamorphism is called recrystallization. For instance, the small calcite crystals in the sedimentary rock limestone and chalk change into larger crystals in the metamorphic rock marble, or in metamorphosed sandstone, recrystallization of the original quartz sand grains results in very compact quartzite, also known as metaquartzite, in which the often larger quartz crystals are interlocked. Both high temperatures and pressures contribute to recrystallization. High temperatures allow the atoms and ions in solid crystals to migrate, thus reorganizing the crystals, while high pressures cause solution of the crystals within the rock at their point of contact. A contact metamorphic rock made of interlayered calcite and serpentine from the Precambrian of Canada. 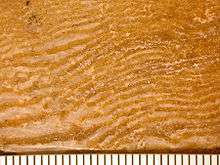 Once thought to be a fossil called Eozoön canadense. Scale in mm. ↑ Dictionary.com entry. Retrieved 14 Jan 2014. ↑ Wicander R. & Munroe J. (2005). Essentials of Geology. Cengage Learning. pp. 174–177. ISBN 9780495013655. 1 2 One or more of the preceding sentences incorporates text from a publication now in the public domain: Chisholm, Hugh, ed. (1911). "Petrology". Encyclopædia Britannica (11th ed.). Cambridge University Press.